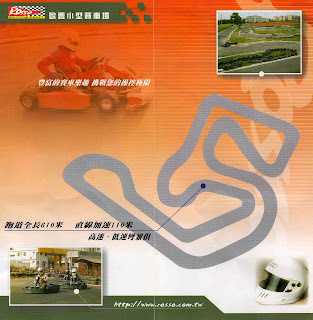 Green Laker: Taiwan: Taichung Go Karts! One of the highlights of this past Taiwan trip was go karting with some industry friends on Sunday. Since the factories are all closed, there was a good number of bike industry people that had a lot of time to kill. I brought my running shoes and some appropriate clothing but didn't want to subject my lungs to the Taichung air. So ironically a group of us decided to add to the pollution by go karting. 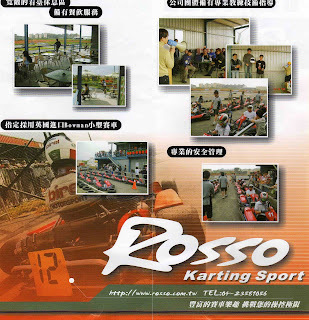 Rosso Karting Sport is located about ten minutes by taxi from our hotel. We arrived when they opened at ten on Sunday morning, only to find it temporarily closed due to a wet track. So we headed on back to the hotel and hung out in the lobby for an hour or so. Sunshine and wind helped get the track back in order quickly, so we hailed another cab to bring us back. Rosso is a pretty impressive operation. A super-fun track with some elevation change and an interesting track that boasts high-speed corners, a nice straight followed by a hairpin and all sorts of challenging corners. Oh, and standard tire walls to keep you *mostly* on the track. A few of us ended up in the dirt/grass/hitting tires, etc. at least once during our races. And then there's the karts. Better than your run-of-the mill US karts in that they had decent tires and 9 HP Honda 4-stroke engines. Most karts like this in the US only have ~5.5 HP. Rosso's karts are overpowered for this track - and it wasn't difficult to get the rear ends of the karts to break loose during cornering if you were still on the throttle. "7) You are not allowed to bumping, we'll provide you hammers, pliers or screwdriver in case you want to murder your friend. Please don't bump anyone on the track on any purpose." "off-track excursion" and was stuck in the weeds for a bit. According to the operator, the track was running a bit slow due to the rain overnight washing off some of the rubber from the track while simultaneously depositing some debris. The best times, put in by Chris Pic from Blue Competition and Brad Hunter ex-Velomax/Easton were in the low 40-second range while my personal best time was a 41:03. The track record is 38:something. Apparently some of the two-stroke 125cc "pro" karts will do the track in the low 30s. After four sessions we were all tired, banged-up and bruised. I still have five bruises on my torso - one where my jeans belt loops are and two more on my ribcage from sliding around in the seat. Next time I'll bring a pair of cycling gloves too - my hands hurt! Hey Mr. Green Laker, I was just floating around the web and you popped up. Thought you might want to check in on different Green Lake items once in a while. Much of what I have on my blog is political but there are other things I get a kick out of and add to once in while. I started this thing quite by accident on day and it has something I never quite expected. Where did you live on the lake? The iceboating was really good this year. Look at some of the photos. I lived in LA for 20 some years before moving back to GL. Drop me a line and add me to your bloglist. I would like to add yours to mine if that would be OK.
Click on the ads once in while. I get paid for that and google will kick me off if I do it myself. Things I Miss About Madison VI. N I N E ! !